Apart from being a widely popular tourist destination in Kerala, Thiruvananthapuram is known extensively a major hub for shopping, mostly for the handmade articles such as the handicraft products, which are ideal as souvenirs. The handicraft dealers in Thiruvananthapuram are actually the manufacturers of handicraft items, handloom items, bamboo craft objects, coconut shell handicrafts and exquisite wood carving. These dealers also run their businesses as rosewood dealers, agarbatti dealers and jewelers. The handicraft shops in Thiruvananthapuram also sell glass painting, art work, embroidered articles, general gift items and corporate gifts. The handicraft dealers operate their business also as manufacturers, dealers, wholesalers, distributors and exporters of handmade objects as well as spice retailers and leather goods dealers. Hi sir I am a artist. 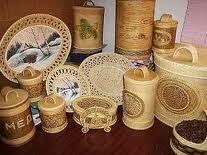 I have some handy craft items, do you want,best quality items,best one is the coconut shell lights.